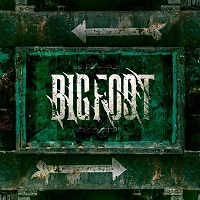 BIGFOOT is a Hard Rock Band from Wigan, England debuting into the atmosphere of a band making their first record after signing with a record label. A display of Hard Rock in the manner of BON JOVI and DEF LEPPARD with outstanding guitar work that enhances a phenomenal rhythm section that perhaps could be more complex and creative if it wasn’t held inside the boundaries of Hard Rock and prioritizing image and loudness over musical innovation. Most of this album is like a Dodge Charger commercial and even though there are ballads and some interesting riffs, the choruses are mostly repetitive and commercially oriented, not the best representatives of what Rock and Roll stands for in the first place, but then again I am sure millions of fans won’t disagree with me when I say this band and most of the stuff done in the eighties must serve as a guidance but not the actual reproduction of its characteristics all together almost forty years later. I might not know anything about this bands but as a member of the general audience denominated platen earth, I would take this lead guitarist and place him in a more innovative style with a different vision towards less partying and more redefining and experimentation towards new boundaries of musical creation. I would always prefer for bands to come up with new proposals or musical approaches, but instead, there is amazing talent in the members of BIGFOOT, I just wish they could take that step forward towards a more personal and less trendy style. Nevertheless this is very well resourced band with a lot of capability and for what they look like, a huge amount of crowd control, they are never short of creativity when it comes to riffs, but maybe just maybe, the genre in which they target their best efforts, could do with the legends so that the new generations can focus on creating a new look into an eroded genre all together.